This huge sum was not payed, which has resulted in a lawsuit that is still ongoing. The demand for such a high compensation doesn’t happen so often but is also not new. Earlier, after the eviction of the Ubica, a squat in Utrecht, an exorbitant sum for compensation was also demanded. The punishment of those who resist is not only accomplished through prison terms; they also try to drive the “guilty” to financial ruin. In this case, the punishment of people who resist against eviction is also the catalyst: The VVD, the political party of van Aartsen asked the city council to claim all of the “damage”. The mayor however didn’t stop at the damage claim for the eviction of De Vloek. The Autonomous Center (AC) also had to pay the price. The AC was evicted from its location in the Bezuidenhout neighborhood after more than five years. Afterwards, three buildings were squatted on the Harstenhoekweg in order to continue with the activities of the AC. The mayor tried to plan a scheme with the owner of one of the buildings to evict it because of alleged danger of asbestos. A lawsuit followed, which the mayor lost, and the building was not allowed to be evicted. A few months later, a letter arrived saying that the mayor intended to shut down the building where the AC is located because it would be housing an illegal cafe. This is how the mayor has tried to close places that are structurally important for the anarchist movement. The procedure to close AC is still ongoing. When Mitch Henriquez was choked to death by the police in 2015, thousands of people in the Schilderswijk rose up against the police and the state. 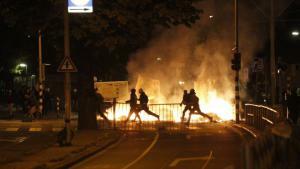 Hundreds of people attacked the police station and there were four nights of clashes with the police. The insurrection was an expected reaction to the latest police murder and to the years of racist police brutality in the neighborhood. For years, anarchists and anti-fascists have been taking action against racist police brutality in the neighborhood, and that is a thorn in the mayor’s side. Several neighborhood organizations tried to deal with the problem of police brutality, but all of these groups worked together with the police and the municipality, or they wanted to join them around the table. Anti-fascists and anarchists are always without compromise in the struggle against the police and their violent practices, and they will not work together with police or the municipal government. The mayor and police have devoted a lot of time to attempting to break the connection between anarchists and the neighborhood, and their protest. Officers went to community centers where flyers were spread to intimidate people into not working with anti-fascists and anarchists; otherwise it could have consequences for their subsidies. Police officers were also sent out to remove posters and demonstrations were prohibited by the mayor. During and before demonstrations, officers kept young people at a distance through intimidation. This however did not yield the desired result. At several demonstrations, many residents of the neighborhood were present and after the murder of Mitch Henriquez the neighborhood rebelled en masse. Afterwards, the mayor in conjunction with the police tried to place the guilt on the anarchists, using them as a scapegoat while trying to break the solidarity of the neighborhood. This witch-hunt against anarchists continued at the end of April when an anarchist was arrested in the Schilderswijk on suspicion of having spread the Anarchist Newspaper, with a text about the insurrection in the Schilderswijk. The comrade was held for four days at the police station and accused of instigation against authority. Later on, a prison term of eight weeks was demanded, but acquittal followed. The Home Office has gone into appeals. Besides the previous examples, anarchists and anti-fascists in The Hague can expect structural “special” attention from the police and the mayor. Demonstrations are prohibited, individual anarchists are intimidated on the street, there have been attempts by the police to win informants, and actions where anarchists are involved can expect a huge police presence. Besides the traditional forms of repression such as raids, arrests, and prison sentences, about which there is much anger in the anarchist movement, lately repression has manifested itself in a more subtle, bureaucratic and administrative form during the last period. This makes it more abstract and less susceptible to solidarity. If the walls of repression are clearly visible in the case of an imprisoned comrade, then in this form of repression, one gets caught in a web of ongoing lawsuits and appeals. In the case of the area ban, they are trying to break the active area of the struggle by forbidding certain people from stepping foot in a neighborhood where social struggle is happening and where it is being fought together. We don’t expect the repression to end here. The mayor and police will stick to the charted course. But we don’t feel in the least as if we are victims of repression. The police and mayor must decide for themselves if they want to have it out for a group of anarchists. Repression will not turn us into sitting ducks and apathetic victims. For every hit one of us takes, we will hit back. It only makes us more resolute to continue the struggle for unconditional freedom. Because we have nothing to lose but only to win, because we are like weeds that keep growing between the bricks of the stifling state, because their time has passed and the time for anarchy has come, and no police officer or mayor will stop us! Our struggle for freedom is stronger than their repression! Hundreds of people attacked the police station and there were four nights of clashes with the police. The insurrection was an expected reaction to the latest police murder and to the years of racist police brutality in the neighborhood.